This Pumpkin Muesli is the perfect solution to dark fall and winter mornings when you need some extra motivation to get out of bed. 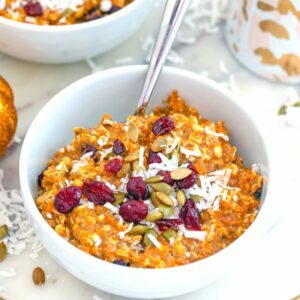 Made with lots of healthy grains, pumpkin puree, dried cranberries, and apple cider, it will keep you full all morning long. In a large bowl, mix together oats, wheat bran, chia seeds, dried cranberries, chopped pecans, cinnamon, and nutmeg. Stir in pumpkin puree and milk. Cover bowl and place in fridge for at least 3 hours (but ideally overnight). Serve in individual bowls and stir in a couple tablespoons of apple cider. Top with coconut flakes, pumpkin seeds, and a drizzle maple syrup for extra sweetness.